La Plata County commissioners and Durango City Council decided to delay funding for a strategic plan to address homelessness. Long-term plans to address homelessness may be delayed as a result of uncertain budget impacts to local governments stemming from the 416 Fire. The city of Durango and La Plata County are bracing for unanticipated expenses associated with the fire and a decline in sales tax collections. During a joint meeting Thursday, the two government agencies agreed to delay funding for a long-term strategic plan until 2019. “I think that’s wise; we are all in this unknown territory” Durango Mayor Sweetie Marbury said Thursday. City councilors and La Plata County commissioners previously agreed to fund the plan this year to create a job description and action plan for a new coordinator to work on homelessness. The coordinator was previously envisioned as an administrative employee that would organize social services provided by other groups. The city and county committed to spend $33,000 each on the plan. Nonprofits, churches and businesses are interested in donating an additional $33,000, but they want a better understanding of the impacts the plan could have on the homeless community, said Ben Delin, the pastor of St. Paul’s Lutheran Church. Officials also discussed plans for short- and long-term sites where homeless residents will be allowed to camp. In the short term, city officials need to decide where homeless campers will move when the site near Greenmount Cemetery closes Aug. 25, City Manager Ron LeBlanc said. The city opened the site in June after a 416 Fire evacuation center at Escalante Middle School closed. “There is no property that we have identified that has not been met with significant objections,” he said in an interview. City Council voted in April to set up a site for homeless residents to sleep overnight adjacent to the Durango Dog Park and parallel to Lightner Creek. But there are some unanswered questions about the health effects associated with sleeping on the site because it is the site of a former uranium mill where hazardous materials remain. In the long term, nonprofits could purchase a site within city limits that could be used for a shelter and campsites, said county Commissioner Brad Blake. City and county officials should try to keep the conversation going around those long-term housing solutions, he said. County Manager Joanne Spina and LeBlanc plan to meet with a small group of leaders from nonprofits, such as Axis Health System, Manna, Housing Solutions for the Southwest, Volunteers of America, and Durango Community Shelter, to discuss priorities around addressing homelessness, LeBlanc said. “It’s not going to be solved by any one entity,” he said. 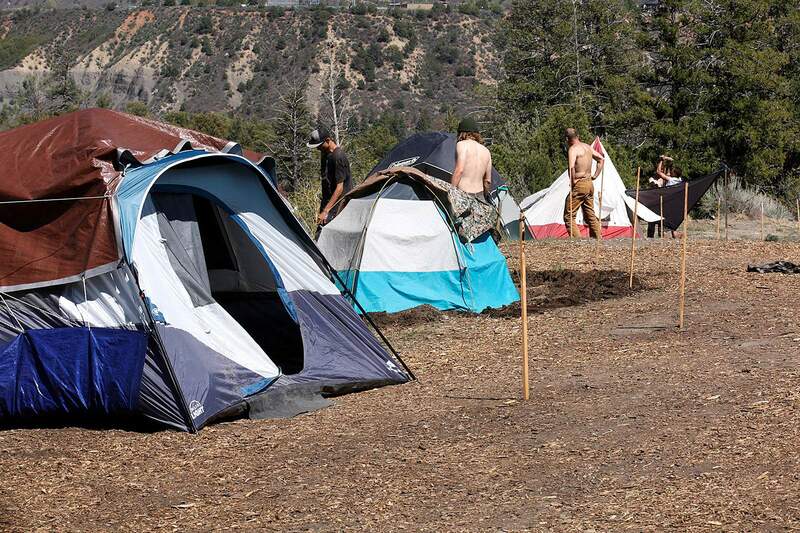 Some churches and nonprofits have expressed interest in setting up a low-barrier emergency shelter for the homeless that could be adjacent to property set aside for camping, said Kate Hallock, an administrative coordinator with the Durango House of Prayer, who attended the meeting. Durango does not have a shelter to serve those who are not sober. The shelter could be paired with opportunities for residents to work as day laborers, she said in an interview. The project will take time, but there have been good collaborative meetings, she said. “It’s been really exciting to see the churches coming together,” she said.